(Apr. 16, 2018) -- The University of Texas at San Antonio (UTSA), home to the nation’s top cybersecurity programs, is taking a leap forward with investments to advance government, university and industry partnerships in the interest of national security by creating The National Security Collaboration Center. Federal, state and local agencies are calling for greater collaboration to protect America’s national security infrastructure. Business and local government partners will have direct access to the technical expertise, highly trained students and specialized facilities that make UTSA a premier program in cybersecurity. As the nation’s seventh-largest city, second-largest cybersecurity hub and home to the largest concentration of cybersecurity experts and industry leaders outside Washington, D.C., San Antonio is uniquely positioned to lead the nation in cybersecurity research and workforce development. With over 2,500 graduate and undergraduate cybersecurity students, UTSA has the nation’s leading cybersecurity program, according to a nationwide survey conducted by the Ponemon Institute. The university’s unique approach includes researchers in business, science, engineering and liberal and fine arts, who work in multiple centers and institutes focused on solving global security challenges in today’s increasingly technological world: the Center for Infrastructure Assurance and Security, the Institute of Cyber Security, the Cyber Center for Security & Analytics and the Open Cloud Institute. The National Security Collaboration Center (NSCC) will be devoted to the advancement of research, education and workforce development in the areas of cybersecurity, data analytics and cloud computing to improve national security and global defense. “The creation of the NSCC is a way to address the immediate workforce needs of industry and government in a strategic way. We are preparing our students by engaging them in basic and applied research, to understand, address and resolve the cyber and national security challenges facing our country. Their time in the NSCC will be valuable in creating a cross-trained, multidisciplinary cyber scholar who is prepared to engage in all facets of cybersecurity whether it be working in government or industry,” said Bernard Arulanandam, Jane and Roland Blumberg Professor in Biosciences and UTSA Vice President for Research, Economic Development and Knowledge Enterprise. The NSCC will be a hub for cyber activity in the region and a home for various federal and industry partners to engage with faculty and student researchers. Students will have direct access and engagement with innovative projects and, due to the highly secure environment, the opportunity to have government clearance which will help them secure higher-level job placements in government and industry more easily upon graduation. Proposed federal partners for the NSCC include the U.S. Army Research Laboratory, the National Security Agency, the Federal Bureau of Investigation, the U.S. Secret Service and the National Geospatial-Intelligence Agency, among others. To foster collaboration between governmental agencies, academia and private industry, UTSA’s partners will have direct access to the technical expertise, highly-trained students and specialized facilities that make UTSA a premier cybersecurity program. The NSCC will focus on forensics; visualization and analytics; network security; cyber training/workforce development; big data analytics and privacy; post-quantum cryptography; cyber physical systems and embedded security; security of the cloud; attack and threat modeling and mitigation; machine learning and artificial intelligence; platform and software integrity; and hardware integrity. The center will also include a sensitive, compartmented information facility (SCIF) to support sensitive research and information exchange; operational, research and training environments for cyber protection operations and investigations; a business incubator to assist faculty, students and external partners in rapidly developing prototypes and concepts to be commercialized for the public good; access to one of the largest Open Cloud platforms in academia using OpenStack software; a state-of-the-art visualization laboratory for translation data into images for large-scale high resolution digital walls or other devices; and a high-performance computing center to support the research and development of algorithms and systems for addressing computational- and data-intensive problems. 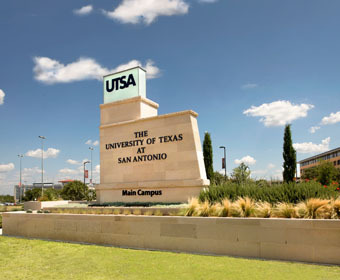 UTSA is ranked among the top four universities in the nation under 50 years old, according to Times Higher Education. Read the San Antonio Business Journal's article on the NSCC. Read President Eighmy’s blog post on the NSCC. Organizations interested in collaborating with UTSA may contact Jaclyn Shaw at jaclyn.shaw@utsa.edu.